Core Design is best known as the developer of the Tomb Raider series but the company had been developing games for eight years prior to the release of the first Tomb Raider game. It was founded in 1988 and was based in the U.K. 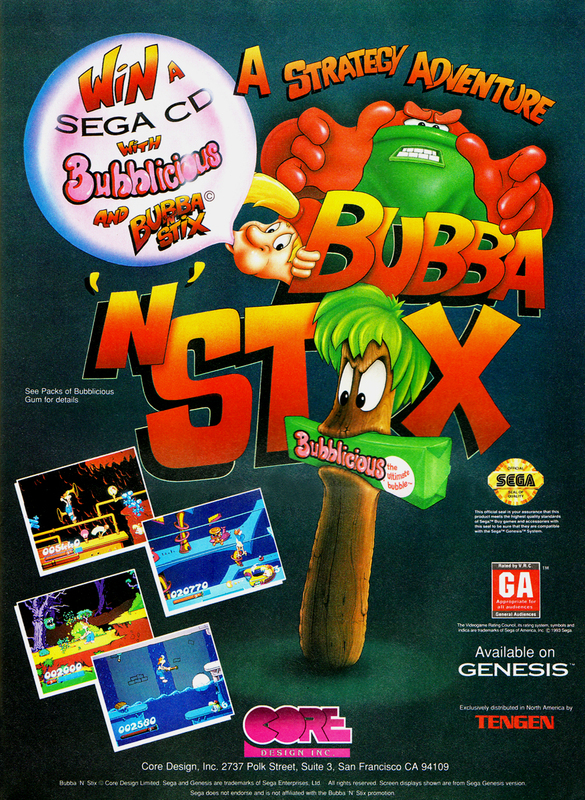 Some of Core's earlier games include Asterix and the Great Rescue, AH-3 Thunderstrike, and Bubba 'N' Stix. CentreGold acquired Core Design in 1994 and only two years later Eidos acquired CentreGold and thus Core Design. Since Eidos published the Tomb Raider games all of those game's ads will be seen when I upload Eidos ads. I played the original Tomb Raider game a fair amount on the PlayStation, though I never completed it. The first one in the series that I finished is Legend which I'd say is also my favorite of the series. After that I completed Underworld, the reboot, and Rise of the Tomb Raider. However, none of those games were developed by Core Design as Crystal Dynamics took over the series after The Angel of Darkness (2003). Core Design was on its last legs at that point as many staff departed and Rebellion took over what remained of Core, minus the Tomb Raider assets. Cosmi was founded in 1982 and has primarily published games on a variety computers. I own a couple of its games on Commodore 64 but didn't play them much at all as they aren't very good: Shirley Muldowney's Top Fuel Challenge and Steve Garvey vs. Jose Canseco in Grand Slam Baseball. I don't know that any of Cosmi's games were big hits and yet it is still in business today as ValuSoft Cosmi (ValuSoft was acquired from THQ in 2012). More recently, before digital publishing replaced much of the PC retail business over the past five years or so, Cosmi had been publishing a lot of budget software and re-issues of older PC titles in jewel cases. Now it looks like it publishes budget titles digitally as many computer game makers do. Crave Entertainment was founded in California in 1997. The publisher is no longer in business but it managed to release more than 100 games in a 14 year span so I'd expect many gamers are familiar with the company even if they didn't play its games. While it may not be known as having many great games, it released many ports from one platform to another, and it had a very strong presence on the Dreamcast. Its Dreamcast releases include: Killer Loop, AeroWings (and a sequel), Tokyo Xtreme Racer (and a sequel), Tony Hawk's Pro Skater, Super Magnetic Neo, Draconus: Cult of the Wyrm, Sno-Cross Championship Racing, Ultimate Fighting Championship, Red Dog: Superior Firepower, Starlancer, Razor Freestyle Scooter, The Next Tetris: On-Line Edition, Surf Rocket Racers, Bangai-O, and Soldier of Fortune. I list all of those in part because I like the Dreamcast but also because that's a significant number of games for a console that didn't even last three years. With 17 Dreamcast releases Crave might have been the console's biggest supporter aside from Sega. While the Dreamcast released in the U.S. in late '99, just before my ads date cutoff of 2000, I'm holding back all Dreamcast ads (only have 21 scanned so far) to group them together and I will be going beyond the '90s for this. However, don't expect it until I'm done posting all of the other ads I have first. This could be a long ways off, perhaps another two years if I wait for the 20th anniversary (9-9-19). We'll see but at some point I'll definitely have some Dreamcast coverage. The ads for all of these publishers is lacking unfortunately. Each one only has 2-5 and four of Crave's ads are for Shadow Madness.